Help is at hand for the Amazon rainforest and Brazil's poverty-stricken rural people - courtesy of the country's famous native nut. Brazil nuts are a valuable food source with a huge market in Europe and North America: up to 7,000 tonnes of unshelled nuts and 20,000 tonnes of shelled nuts are shipped every year. And because the trees that supply the nuts grow wild, they offer a way for communities to make a living from the forest without destroying it - something that is now being put to use in the country. "This is a real financial resource for communities," Dr Rafael Salomao, who works at the Museu Goeldi, one of the most important centres for the study of the Amazon, told BBC World Service's One Planet programme. "A tree which is over 400 years old can provide for generations and generations." 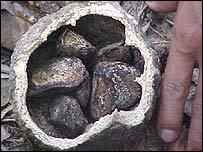 Brazil nuts are considered to be one of the most valuable products that can be harvested from undisturbed rainforest. The nuts, known to Brazilians as Castanha do Para, grow uniquely in the Amazon basin. They are hazardous to collect: each hard outer shell weighs over 1kg. However, they offer an alternative to the way that many areas of Brazil are trying to develop - by clearing the forest to create areas suitable for either grazing cattle or growing products such as soya. For many years, this meant the destruction of Brazil nut trees, even after they became officially protected. "Sadly, today, we have cemeteries of Brazil nut trees," said Dr Salomao. "It's because of the arrival of agriculture. We call it the 'agricultural frontier', which goes along with cattle ranching. "When this arrives, they destroy the forest. First, they exploit the valuable wood, and then the cattle ranchers come and turn it into pasture. "Having said that, they keep the Brazil nut trees as well as the rubber trees, as these are legally protected. 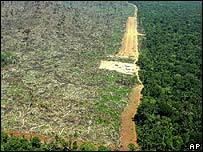 But they burn the forest to clear the land and the Brazil nut tree is very sensitive to fire. After three years of repeating this process, the trees are dead." What is worse for Brazil nut collectors is that once the trees have been destroyed, there is little chance of getting them back. Attempts to replace them have been largely unsuccessful. Saplings will not grow in shade and take up to 15 years to begin producing nuts. "Brazil nut trees do not have an easy natural regeneration," said Hans Muller, who works at Belem's Embrapa Institute, specialising in agricultural research in the Amazon. "When you destroy one, it's a real loss. "Unfortunately, when they have talked about sanctuaries - places where you can't touch any plants at all - well, they don't exist." 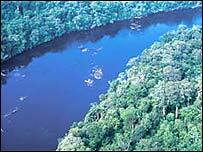 However, at the end of 2006, the governor of the large state of Para announced a protected reserve of 16.4 million hectares of forest, with the aim of creating a huge conservation corridor through northern Amazon. And in the state over Para's northern border, Amapa, small communities are taking to the challenge of using the Brazil nut to generate income from the rainforest without destroying it. "We had this idea, we've a vast resource of Brazil nuts and we needed to create organisations in the region in order to strengthen local production," said Ajama da Silva Mendes, from the Amapa state department of industry, commerce and minerals. "So the government gave some incentives to create co-ops, together with the communities. "Now we can see the promise of bigger production and better living conditions for rural workers." Brazil nut gatherers and their families are now able to maintain a decent livelihood. And small-scale factories have been set up producing Brazil nut biscuits and oil, broadening the range of products available for export, meaning there is a better way for people to get a fair price for their valuable resource. But there are further problems. Subsidised production in Bolivia is challenging Brazil's dominance in the market. And when, in 2004, the European Union found that Brazil nuts with shells on had traces of aflatoxins, which can cause liver cancer, strong regulations were put in place regarding the nuts. While the American limit on aflatoxin levels in Brazil nuts is 15 parts per billion, the European limit is just four parts per billion. This has hit Brazil nut exporters hard. "In case the product doesn't meet the EU's laws, all the costs which have arisen have to be paid by the exporter," said Benedito Mutra Emfilio, chair of Association of Brazil Nut Exporters. "This is impossible."